The Third PDC at Escola Da Terra drew a different crowd which was a pleasant mix of Europeans, N.Americans, and even an Aussie. Some say the Northern Europeans even brought the foggy weather that is quite rare in these parts during the summer but very reminiscent of the summer days in California. This course also marked the return of Gautier to the teaching team which was a helpful addition to a holistic course that featured using the outside space as a teacher in far greater numbers of class hours as we have made quite some progress on numerous sites in Almocageme. Building off the lessons learned at the course in Bulgaria, we decided once again to launch right into the name game through a more interactive experience which allows functional interconnections to be facilitated at a rapid pace. Students were asked to write on a sheet of A4 paper that was then taped to their chest what their needs from their community were and additionally what they could offer their community. It’s a lead into the Functional analysis where we look for inputs and outputs so that there is no waste and we create cycles and loops so that the elements nourishment happens locally. Through this exercise students immediately know more context to others lives and are open to asking for help or offering suggestions immediately. It’s a great way to begin and I am sure future courses will continue to employ this exercise upfront rather than wait till the end for the transition towns topic. 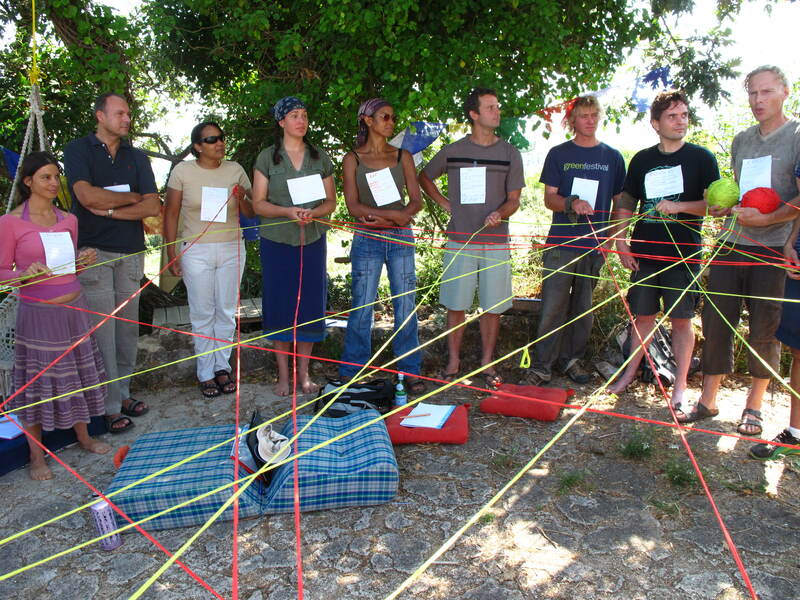 Over the next couple of days we delved into the basics of Permaculture in various theoretical lectures, interactive games, and hands-on session to really get the brain turning and the eyes seeing new patterns in the landscape. We really emphasize the design aspect of the course and slowly march our way through the design principles. From this a thorough understanding of how to interpret landscapes and then how to apply the fundamental design principles as reflections of natures inner workings is of much greater importance than the minute details of specific design elements like greywater. We want you to know why you are using greywater and how to link it up with other design elements to reduce our consumption or waste or pollution habits. 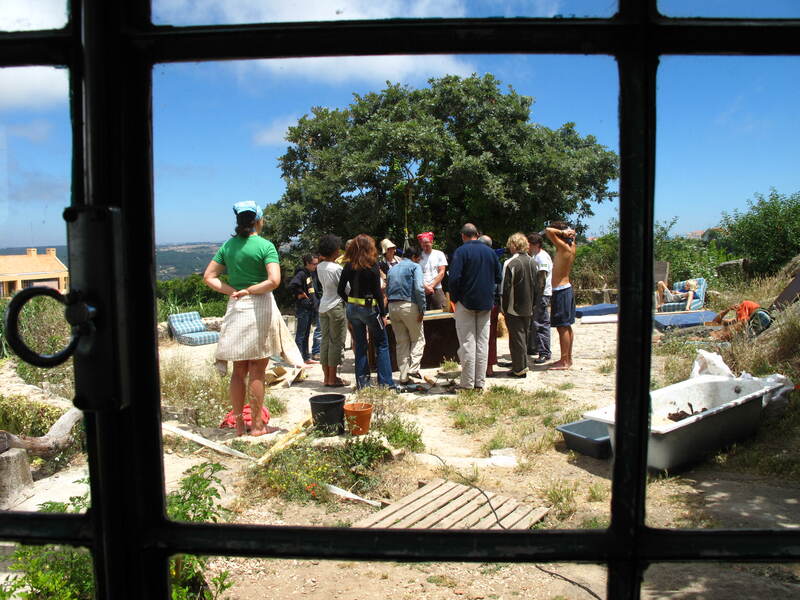 Conscious design is what encompasses Permaculture, not just chicken tractors and swales. 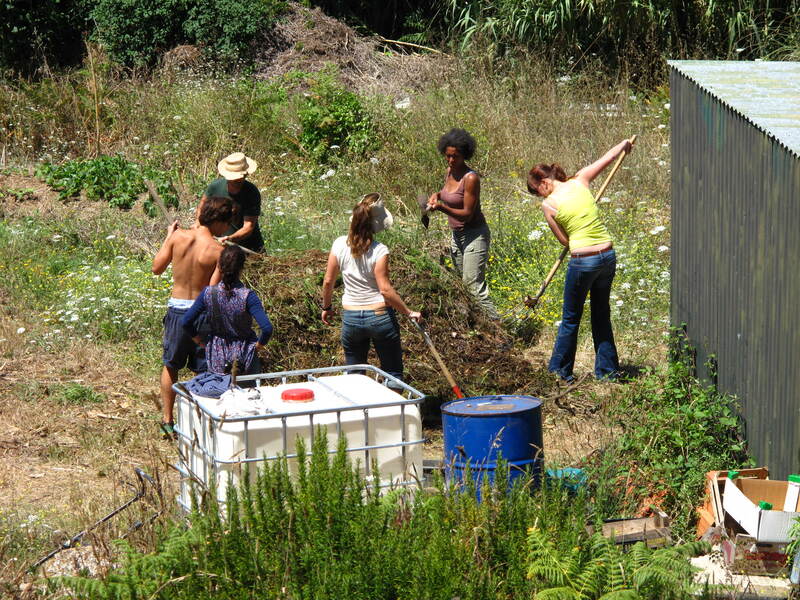 With the work we put in during previous courses like swale making and compost pile making, the gardens at the escola were full of great examples of Permaculture techniques and principles. We saw a brilliant natural guild that had been developed which made that link between following natures patterns in our design and implementation work all the more easy. In the above picture on the left hand side you can see white flowers on the uphill side of the first swale that one year ago was a parking lot. That upper slope has been planted with two Nitrogen fixing trees called Tipauana Tipu and also a Pomegranate. We of course mulched it and planted some nasturtiums around the base but did nothing else to bring that area back to life other than putting some rocks in the driveway to make a barrier for the cars (Sector or Flow analysis alterations in effect). Those white flowers are apart of the magical earthly process called succession. Without seeding this is what nature had created, a somewhat chaotic looking system that was full of niches being filled elegantly. Never mind species names, there was the umbelliferous plants, the white flowers, drawing in predator insect and pollinators above ground while below ground its deep tap-root is helping to break up compaction and feed soil life. Next to it was clumps of a taller nitrogen fixing legume again growing wild with stunning purple clusters of pea shaped flowers and lots of biomass. Intermixed further were several species of Asters, showing their multifunctional usage with their deep tap-root as well, biomass production, and pollinator and predator insect drawing abilities. To round off the guild was plantain, or English Man’s Footstep as it is often called in N. America. This is a medicinal plant that when you have an open cut, you simply chew it up, spit the liquid out, and apply it as a poultice to the wound. This plant medicine helps to draw out moisture and serve as an antibiotic and a great way to close the wound from the eyes. Think it’s doing the same for this former driveway. Nature is abundant. We again made compost early on in the course as there were several additional beds that had been created by Pedro and others during the spring from compost we made in the winter PDC. Those beds produced lots of zucchini and hade some incredibly beautiful tomato plants growing as well. We did the standard layering process and processed a lot of “waste” organic matter. I am always amazed at how much organic matter I see when driving around the local Sintra area as people just see it as trash. We see it as a treasure for mulching and compost making. The upper food forest/edible landscaping closer to the school also got a much-needed mulching during this exercise as we like to have small groups in our hands on experiences to make them more effective. The course featured several guest instructors and one was good friend to both me and Gautier, Sara Wuerstle. I met her in New Zealand at a Natural Building Workshop were we became friends and have worked on projects here and there since. 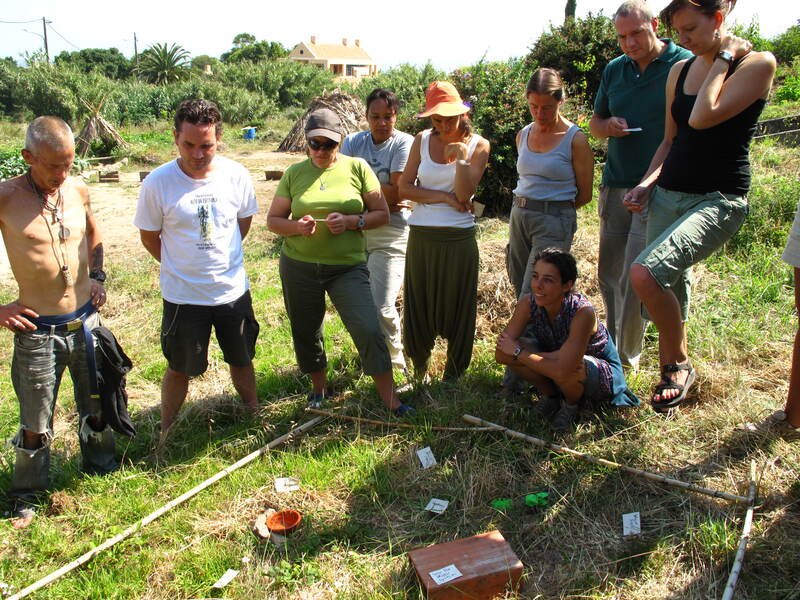 She came to Portugal to help with this course both on the natural building front but also to get her feet wet with teaching. She was a great help for me during this time and the students loved her experience with building with Earth and animal husbandry. So Sara and another friend and past student, Dan, came up with a design and course of action for an integrated cob oven, social space, and also a bench for holding the ingredients for the pizza’s. 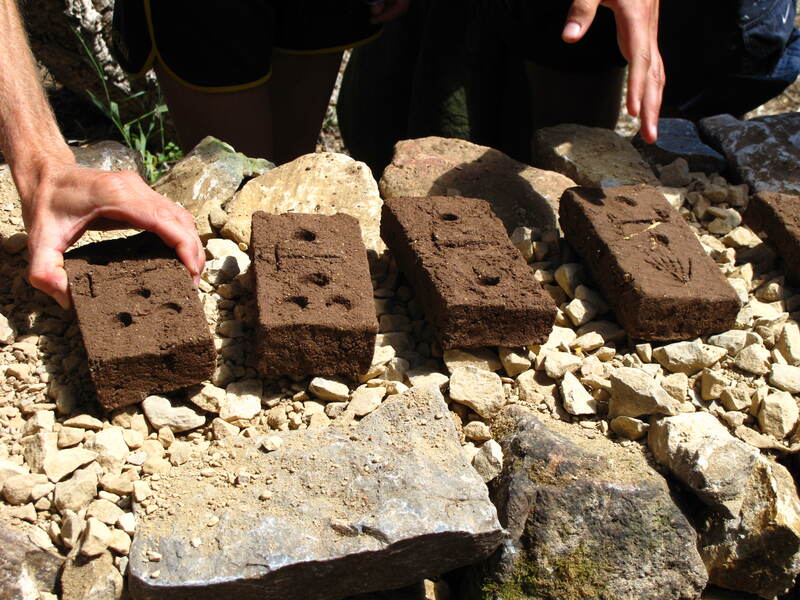 The initial process after site selection was to do some test bricks to see our ratio of clay to sand mix. These bricks are allowed to dry and are examined for cracking and strength so that you can accurately do mixes on a large-scale. The domino look to the bricks is a system that requires no literacy that Sara picked up in her days in Mongolia. Dan and Sara gave us some basics into how to make mixes and then how to begin to work with clay. Before you do the clay work, you must start with a foundation for a cob oven which Dan gave us his perspective on working with stone. He is quite zen when he is arranging and placing stones and it is a true pleasure to see his work afterwards. So from there we broke off into several groups to get the mixes ready to be applied. 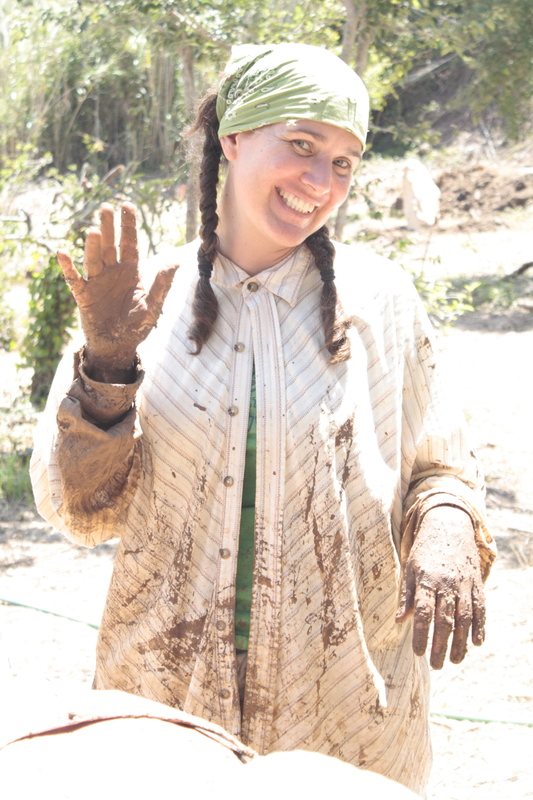 We had one group in the mud pit which Gautier launched himself into and managed to cause lots of havoc in. This group was charged with getting the water into the clay and mashing it all together to then be later carted off. Another group took on chopping straw as cob requires smaller cut fibers. Then some folks were working the sand into the clay and fiber. These mixes were again done based on our test bricks and allowed us to fly right through it with no questions. So folks were barefoot stomping away, pulling up the tarp every once in a while to fold the earthen material over, and overall dancing and having fun stomping. From there we started to apply the base to the strawbale bench and platform of the cob oven. In the picture above you see some etches as this is the necessary step as this is what is called a scratch coat. From there we apply a finer coat and these etches allow for this next layer to have some teeth to grab onto. Overall this lesson in Earth building from Dan and Sara was a wonderful addition to this years summer PDC where hands on planting is tough to do in the normal 35 degree heat. Additionally Pedro, from the escola and the first course, gave us a download and a bit of a demo on how to make a worm bin system that allows you to harvest the castings from the bottom rather than disturbing the worms. It’s a very excellent design and does give some definite advantages over the bathtub system that I do recommend. Thanks also to another former student, Ze Parreria, for coming and giving us a very lively and engaging session on Economics and poverty. 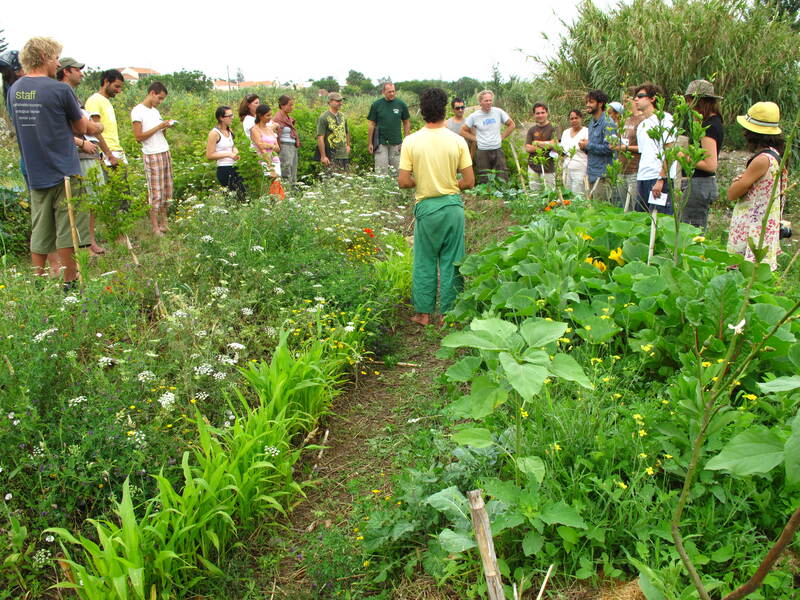 It really is the next frontier, maybe the final frontier of permaculture, of how to build a true permanent culture. Joao Gonzalves came through as well to present on the social side and thanks for that Joao. One of the best highlights from the course was Gautier giving the tour of one of the finest pieces of Permacutlure on a small-scale intensive system. It has come along way in one year from when I first was introduced to this particular piece of land called Terra Mae. It still is progressing but the signs are sooooo obvious from the drastic improvement in the overall feel of the land as well as solar harvesting. Last year everything was brown and many of the trees were sickly and the lemon trees were on life support to say the least. I looked at them and just felt what a shame. A tree that had soooo much potential yet the land had been so over abused and not cared for, that the lemon trees were failing. Yet after some earthworks to put the water back in the ground, some biology spread, some energetic work facilitated, and lots of love the lemon trees were no longer yellow. They were tipped with that classic red tinge of new growth on subtropical trees. They were beginning to produce fruit again, although just a few, next year there will be a bounty. The most surprising observation that I made was of the local cork trees that Gautier worked around quite sensitively during the earthworks as they are a protected species in that area. Not only were they protected but all of them had huge shoots of new growth, some up to 30 cm which when looking off site in that same local it was not so. This is a great demo that water harvesting techniques like swales and terracing can have an huge benefit for local ecologies as well as the cultivated ecologies that mostly compose Permaculture systems. Furthermore, the mango tree was putting off some new growth and Gautier is working hard to water the trees and mulch them thoroughly to get them through for some their first full summer. So good work Gauteir, thanks for all the help and insights from the course and the work we have done together in the last year and a half. Thanks to all the students and the community of Escola Da Terra for another pleasurable course and wonderful learning environment. Just looked through the blog…looks great…and this time I will take part in the course! See you in July! Nice to see all that permaculture going on!!!! And great to see Dan building the oven!!!!!!! I hope Nicky and me con visit you this year!!! !